I would like to think that I don’t have to explain Loving vs. Virginia and that the case is common knowledge. The book is the story of a landmark civil rights case, told in spare and gorgeous verse. Mr. and Mrs. Loving were very much a private couple and Patricia Hruby Powell does that privacy justice. Powell beautifully and elegantly captures how two teenagers fell in love without somehow violating their privacy. I was very much captivated by the verse and I’m not normally a fan of this type of writing. However, Powell’s verses are magnificent. The novel mixes photographs, from the period, with phenomenal illustrations done by Shandra Strickland. I’m not sure what else to write. Loving vs. Virginia: A Documentary Novel of the Landmark Civil Rights Case is simple yet powerful. Easily should be on everyone’s reading list not only for Black History Month but for Valentine’s Day. No question, one of my favorite books of 2017. 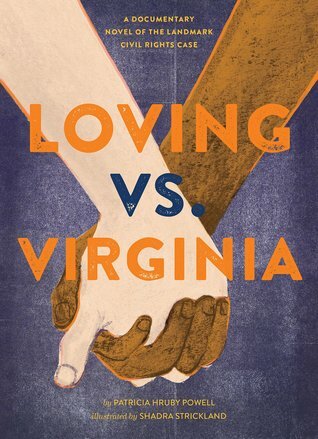 This entry was posted in Adult Nonfiction, Young Adult and tagged Adult Nonfiction, Loving vs. Virginia: A Documentary Novel of the Landmark Civil Rights Case, Nonfiction, Patricia Hruby Powell, Shandra Strickland, Young Adult. Bookmark the permalink.